Fright Nights - THE BRAIN OF MORBIUS / FRANKENSTEIN | Warped Factor - Words in the Key of Geek. Christopher Morley looks at the 1976 Doctor Who story 'The Brain of Morbius', and the themes it shares with Mary Shelley's Frankenstein. The horror! The horror! Let chills run down your spine as we explore the ' Gothic Horror' years of Doctor Who- Seasons 13 &14 popularly credited as such. 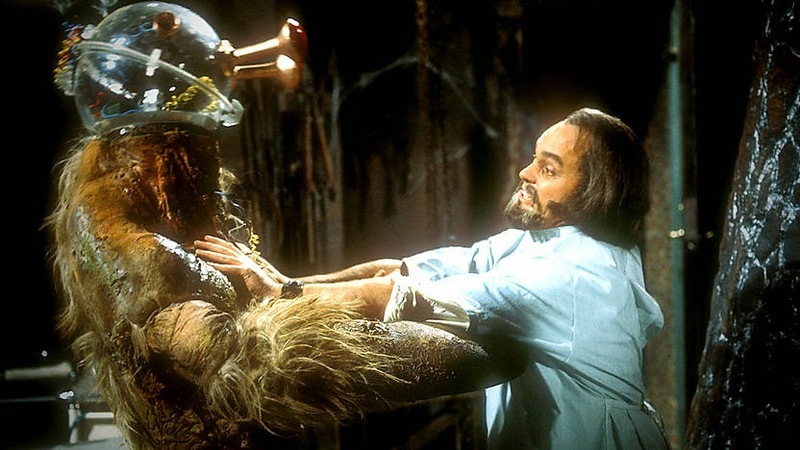 With that in mind, lets take a trip to Karn & behold the grisly spectacle of The Brain Of Morbius ( Episode Three of Season Thirteen), an attempt by Robert Holmes & Terrance Dicks, under the pseudonym of ' Robin Bland' to come up with a science fiction answer to Mary Shelley's 1918 novel Frankenstein. Perhaps most obviously, the scientist Solon is based around the cinematic portrayal of Victor Frankenstein- which casts him as a typical ' mad scientist' where the novel presents him as rather a tragic figure. His most commonly acknowledged first appearance on the big screen is most likely James Whale's 1931 adaptation with Colin Clive as Victor & Boris Karloff as his monster. The tone of The Brain Of Morbius, though, suggests it has more in common with 1957's The Curse Of Frankenstein. You might recognise the man playing Victor, too- its Peter Cushing, who of course played a ' non-canon' Doctor in two 1960s films ( Dr Who & The Daleks & Daleks- Invasion Earth 2150 AD). He was also on a list of possible candidates to play Solon before Philip Madoc got the part, perhaps in light of his Hammer years! 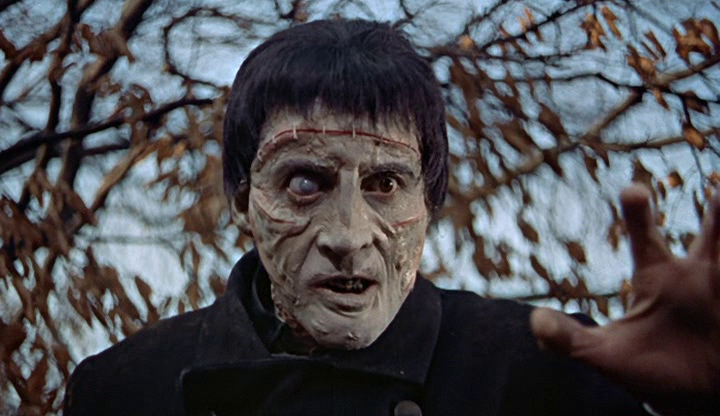 Check out also Dudley Simpson's musical score, which appears to take its cue from the likes of Hammer man James Bernard, who would go on to contribute music to every subsequent 'Hammer Horror' movie- The Curse Of Frankenstein widely accepted as the first. Among others, you can hear Bernard's work in Dracula ( 1958), Plague Of The Zombies ( 1966) & The Devil Rides Out ( 1968). We should point out that Simpson was no slouch either. He provided music for everything from Planet Of Giants to The Horns Of Nimon - making up a grand total of around 62 episodes, including a cameo as the conductor of the Palace Theatre orchestra in The Talons Of Weng-Chiang. He was dispensed with by John Nathan-Turner in the early 1980s after decreeing that all future incidental music was to be composed in-house by the Radiophonic Workshop. 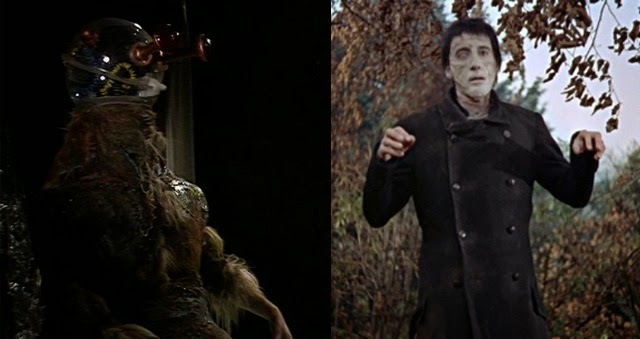 Playing the monster to Cushing's Frankenstein was his long-time friend Christopher Lee. But what of the Morbius monster? The name ' Morbius' is taken from the 1956 cult horror Forbidden Planet. Solon is revealed as a follower of his, a member of the Cult of Morbius who had saved him from execution! Prior to which he had served as President of the High Council of Time Lords, perhaps the most divisive candidate ever to hold the position. While some supported the more militaristic nature of his policies- attempting to conquer worlds around Gallifrey- he also found himself with several opponents. Solon was at least able to save his brain after his physical body had died, & with his personal Igor, Condo, set about the task of building him a new one. The Doctor's head is indeed in demand, & the Sisterhood of Karn aren't too pleased to see him either, believing that he's been sent by the Time Lords to steal their elixir of life. The faces seen during the ' mindbending' duel between the former Lord President & the Doctor are in fact those of members of the Doctor Who production team at the time! Much debate ensued over whether they could have been previously unseen pre-First incarnations of either the Doctor or Morbius, but they are ( in order) Christopher Baker, Robert Holmes, Graeme Harper, Douglas Camfield, Philip Hinchcliffe, Robert Banks Stewart, George Gallaccio & Christopher Barry. 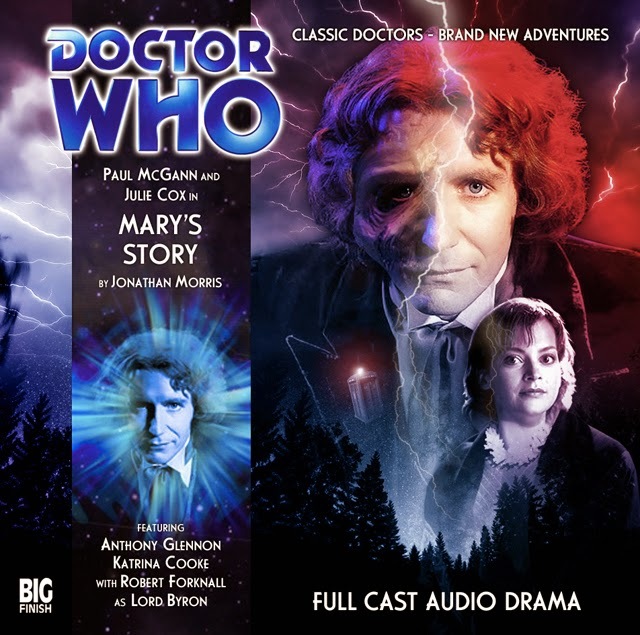 Of course, the Doctor will return four selves later in The Vengeance Of Morbius & then take Mary Shelley herself as a companion ( Mary's Story, The Silver Turk, The Witch From The Well & Army Of Death). Indeed, its implied in their first encounter that he provided the inspiration for the ' its alive!' moment. Understandably she was probably quite impressed & ended up travelling with him in the TARDIS for a spell. She'd encounter Cybermen in The Silver Turk, find herself in the midst of seventeenth century witchery in The Witch From The Well & then depart after a battle with the Bone Lord in Army Of Death- the Doctor, though, would later return to Karn solo. He'd been running from the Time War, & even after witnessing a child die at the hands of a Dalek ( Museum Peace, from Short Trips- Dalek Empire) refused to join the conflict, instead later saying he ' helped out' whenever he got the chance. Of course, ultimately he realised that indeed he was the only one who could stop the War, leading to his regeneration into the man he needed to be- a warrior. Given a bit of a push by another of the Sisterhood's elixirs, which had the desired effect of being able to influence the process to the extent that he could indeed become exactly what both the Doctor & the ladies from Karn ordered. 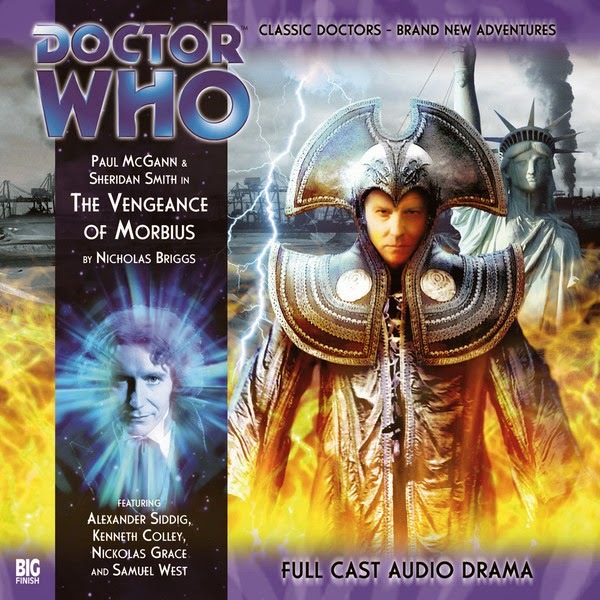 Even earlier than all that, though, the Fifth Doctor had encountered Morbius in Warmonger. As ' The Supremo', he would lead an alliance against him- humans, Ogrons, Draconians & Sontarans among their number. Solon helped Morbius, or ' the General' by supplying him with an army of the undead! Of course, the Supremo is victorious, & Morbius sentenced to execution- placed in a dispersal chamber & spread across the nine corners of the universe, as remembered by Maren of the Sisterhood in her earlier encounter with the Doctor's previous self. But what of Morbius's vengeance? The Eighth Doctor & Lucie Miller would battle a later Cult of Morbius led by Cristophe Zarodnix- who used gene splicing ( fusing the remains of Morbius's brain with DNA from a captured Time Lord, Straxus) to give the despot a new form after buying the planet Karn itself.